"Die Info hab ich in einen Forum gelesen." Die Info hab ich in einen Forum gelesen. Mir liegt eine Mega Fun Interviev von Factor 5 vor, wo Julian Eggebrecht folgende Daten angibt: Amerika 80.000 Stk, Europa 100.000 Stk und Japan 30.000 Stk. 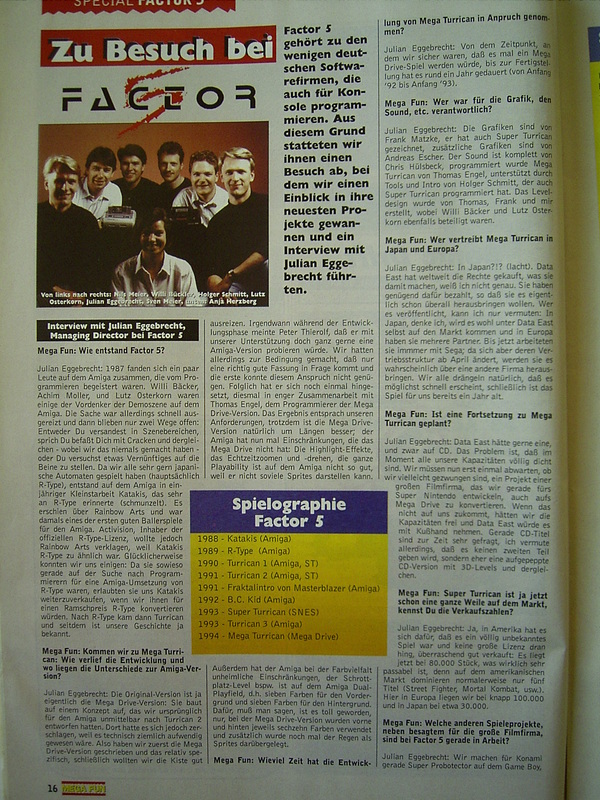 - Das Interview wurde 1994 gemacht. Hi Guy! I'm Vincenzo the developer of TurBall. Finally i have more time for convert my turball pinball from visual pinball to future pinball. I'm working on new graphic and sound. Stay tuned for new release. Super Turrican hat sich 250.000 mal verkauft; 50.000 Stk. wurden in Japan abgesetzt - not bad ! Wir haben hier ja auchnoch den Bonus der schlechten deutschen Synchrospur, das macht "einfach fantastisch!" noch besser. Genau bei den Satz wird der Mund ganz weit aufgerissen, und zwar immer genau dann, wenn kein Ton rauskommt. Wenn ich höre "einfach großartig" muß ich immer denken an: "Ich fühle micht smarter, aggressiver, ... als könnte ich die Welt erobern"
Für diese Leute ist das wohl die perfekte Presentation. @Torsten: Du musst morgens mal mehr einschalten. Dauerwerbesendungen wie diesehier sind keine Seltenheit! Wenn ich krank bin, und kaum was tun kann, dann ist sowas immer perfekt. Da schalt ich mal nach Monaten den TV an, seh ich schon den Zombi... einfach großartig. Wäre ja interessent ob sich da richtige Turrican oder das straight-forward besser verkauft, aber nicht einfach genug es herauszufinden. Ah, die erste Seite. Ja, waren nur 4MBit und über die Verkaufszahlen habe ich keine Ahnung. An warme Semmeln glaube ich aber nicht. Aber hatte Super Turrican nicht ein 4mbit Modul? Ob sich ST2 besser verkauft hatte? Wer hat Verkaufszahlen? Am I the only one who thinks that Hurrican should have Joystick compatability? Wurde auch in den Zeitschriften damals prima bewertet, soweit ich das mitbekommen habe. Letztlich sind eben doch noch weniger als 50% der Menschheit Turrican-Fans. Wird so einer sein, der bei Turrican nur den kürzesten Weg nimmt... Für solche ist das Spielprinzip dann wirklich weniger geändert. "8MBit-Modul" + "Am bewährten Spielprinzip wurde zum Glück nicht viel verändert" + "Mit dem Jet Bike düst ihr durch grafisch anspruchsvolle 3D-Level" + "Factor 5 in die vollen gegriffen"
schade dass Turrican 3D und seine Entwicklung von THQ eingefroren wurden.. ._. Huch, seit wann wurden denn die Codes für und hier vertauscht? It it is done, I translated my page! Enjoy my bad English at http://www.englishturricanzone.de.vu ! Aber dennoch ist gleich wieder Chat. Hm. Dann bin ich ja darauf angewiesen, die Original GC-Games noch zu bekommen. Und kann man denn auch Import-Versionen benutzen? Ist das Download-Archiv auf europäische Versionen begrenzt oder kann die ganze Welt alles spielen? @Marcus: GC-Spiele wird man nicht downloaden können, man kann die Originale direkt reinstopfen und hinter einer Seitenklappe stecken sogar die vier ganz normalen Cube-Gamepad-Ports. One thing is for sure, if Turrican had as good of a work ethic as Mega Man did , Turrican would be my new favorite game series. Strangely enough everyone I show Turrican to loves it. It's a great game series I just think due to bad publicity and advertising, it just didn't kick of here in the states. Not really, It's kind of an underground thing. And I know about the Turrican FPS but search As I might I can't find any new info on it, so I just assumed it was dead. Was Turrican popular in the US? Or were you even talking to me? Sorry, I don't speak German. I live in Tennessee. In der neuen Maniac wurden GC-Spiele nicht erwähnt beim Thema Download für das Wii. Wird das nicht möglich sein? Ich überlege nämlich schon, mir mal wieder eine Konsole zuzulegen. Der Saturn ist lange her. How about a Turrican TC for Doom? jo Leute, gibs was neues? For "the system", to destroy it with overhyped mathmatical correctness. Let's port Robert. Or shall we emulate him? Or a Mega Man TC for T2002? Here's an idea... Why not port all of the Amiga Turrican games to the PC on one program? Cause wii brauch Übung and so. I know, but most x thinks that y who give hints are rude. Anyway, enough english lessons for now. I'm not rude, I'm giving you a hint. I was too direct again, but please think about it nevertheless. I think we're not 1:1 on this topic. And it's no need to getting rude. Error = any difference to the original. But frankly, your Pippi Longstocking attitude is annoying, I can't help you if you do not want to understand the issue. You can't proof me that Turrican runs 1:1, anyway. We should clarify what we mean by saying "error". Errors that appear in orignals or errors made by emulation? Of course it does, this is what makes 1:1 possible - in practice, not only in theory. Theoretical it's may right but practical totally wrong. I know, but this don't make differences to the players when they want to play 1:1. That's the low level stuff I tried to explain erlier. Errors are obvious. If they are not obvious in game x they are obvious in game y. So tell me, how do you can be sure that a game runs 1:1 without completly testing every game situation? The slowdown thingy is wrong, emulators of older systems correctly emulate slowdowns (actually they have to, many games wouldn't work otherwise). Every time when there is a slowdown on orignal hardware there isn't one at emulation. Only because you can't notice it consciously it does'nt mean that it's not there. I never doubt that there are emulators without user interfaces. Then show me something in Turrican which is wrong in WinUAE. And for emulators without interfaces, look at your own collection, we already talked about that in IRC. WinUAE can emulate Turrican 1:1. And emulators don't need user interfaces, I have many emulators which don't have one. Yes, user interfaces and where is your wondermashine that can emulate 1:1? Do you mean user interfaces? I don't know what you mean with your first sentence and your second sentence is wrong. Emulation needs additional interfaces, which is the biggest weakpoint of emulators. And there isn't a Emulator that can really emulate 1:1. Well, nothing beats playing the original, but WinUAE for example is really close. At least one emulator exists for most pre 32 bit systems, which can emulate more than 99% of the games 1:1 (and I mean 1:1). The truth is, most emulators are patchy but they don't have to. And gamers don't want to wait for emulation status when they can have the game running stable within weeks. No. Making an emulator for many games ensures that even errors that are not obvious in one game are removed - cause they are obvious in another game. This would be the case if the developer made an extra emulator directly for the game. Because developers remove obvious errors. Agreed. But why are obvious errors better for players? If the same goes for users, the mankind should be fixed. Cause an emulator works on a much lower level, which makes almost every error obvious. Neither ports nor emulation run one-to-one. Porting is more stable. Usually porting 1:1 does not work, developers change little things by accident and do not realize it. Emulation is better. Why emulate, when you can port it 1:1? @marcel: why port something 1:1 when you can emulate ist ? Ja, wer hat denn da eben böse Egoshooter-Spiele gespielt? Da hat irgendwas rumgesponnen, musste nur den Webserver neu starten. War leider bis eben außer Haus. oh boy. why don't they just make an all new commercial turrican? or at least a port of the old games. those homebrews are nice but they're not the same as a real turrican game. Robert wartet seinen Server wohl im Moment, da der Webserver down ist, der Computer aber noch auf PINGs anspricht. Ich meld mich wie immer schonmal für eine Karte an. Ist irgendwas mit Eurem Server? Ich komme grad nicht drauf? What balls, did a file disappear?